This week we had the pleasure of eating dinner with our friends, PC and Tonya. When Tonya asked me what I thought we should have for dinner, I politely (okay, I begged) asked her to make her now famous potato soup. She generously agreed to allow me to share the recipe with all of you. She originally found the recipe on Pinterest, however I can't find it anywhere. Tonya is a recipe modifier like ahem, yours truly, so I'm giving her the credit for this masterpiece. I really like this soup because it's great for people who are lactose-intolerant, like Anthony. I know you are going to love it! 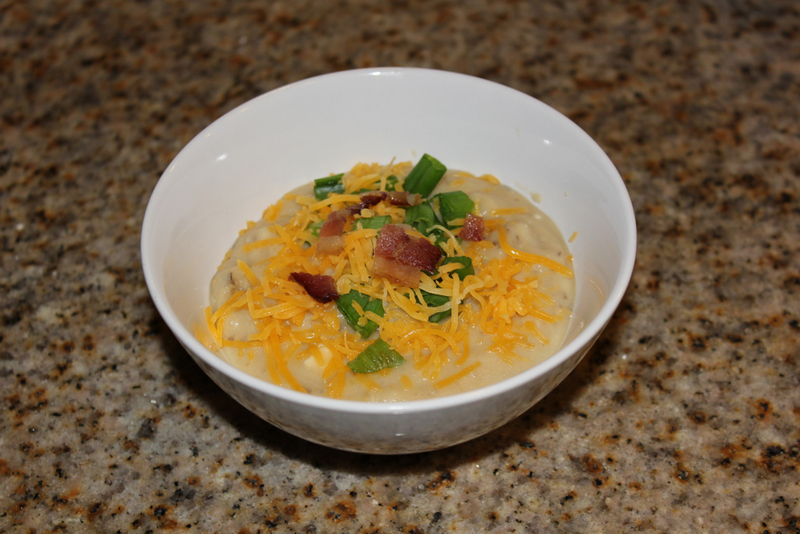 Garnishes- sour cream, grated cheese, bacon, chives, green onions, etc. Combine all ingredients in the slow cooker, except cream cheese, milk, & garnishes. Cook on low for 7-8 hours. Purée until desired consistency is reached with an immersion blender, food processor, or blender. Return to slow cooker. Cube cream cheese and add to slow cooker. Add 1/2 cup milk. Cook on high for 30 minutes. Salt & pepper to taste. Are there any recipes you enjoy serving to guests?